Kat - This week, we are celebrating 50 years of the laser and to fill us in on the background of the laser and some of the cutting edge applications and research that's currently going on, we're joined by Dr. Graeme Hirst and he's the head of laser application at the STFC's Central Laser Facility. Hi, Graeme. Graeme - Hello there, Kat. Kat - Let's start off by asking the question, what is a laser? What is a laser and how does it work? Graeme - Well I think most of us have an idea of what one of these things looks like. It's a small box out of which comes out a very bright beam of light and I guess what you want to know is what's inside. 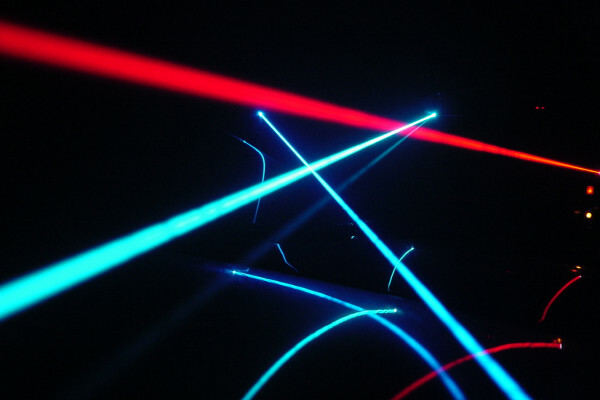 The word LASER stands for Light Amplification by Stimulated Emission of Radiation. So what's inside there is an amplifier. It's a device where you put a little bit of light in and you get a lot more light out. And usually, that comes in three parts. So there will be some stuff which does the amplifying, some material. There'll be a sort of power to pump that stuff to keep it in an excited state where it's capable of amplifying and there will usually be an arrangement of mirrors, and what the mirrors do is take control of the beams. Instead of the light coming out in all directions, in an uncontrolled way, you get that nice pencil-like beam out of the end. Kat - So you got a very intense beam of light that can really be controlled in a very precise way. What sort of frequencies of light can we use? We've had a question in from Klvn8r on Twitter who says, "Can a laser light be from anywhere in the spectrum of light?" Graeme - A very scary thing, yes. Kat - Lasers have been around for about 50 years. What was the background of lasers? I've heard them described as a technology looking for an application. How were they first invented? Graeme - Yup! Solution looking for a problem. They grew from a background research on microwave amplifiers, which if you like is a sort of very short wavelength radio wave, and as the wavelength got shorter and shorter - and light, if you like is just a different kind of electromagnetic radiation - There was race on it to be the first one that you could see, essentially. And Ted Maiman generated this ruby laser back in 1960, 50 years ago, the first laser you could see, and he won the prize. Since then, the applications have just spread out enormously. To begin with they were a very useful research tool, but pretty quickly, people got the hang of the fact that you could cut and weld with these and you'll remember the James Bond film Goldfinger where cutting and welding was very much to the full. Kat - Absolutely. We do seem to see so many applications - from laser light shows at pop concerts, if you follow fashion laser cut shoes are very in at the moment, you can have laser surgery on your eyes, and presumably, a whole host of very technical applications. What's the sort of diversity that lasers are used for nowadays? Graeme - Just about everything. Look around your house, you'd be surprised how many things have been made by a laser. Pretty well all the silicon chips, your flat panel TVs, as you say, a lot of stuff's been cut. We're working on quite a range of applications here. Everything from using lasers to look inside blister packs that have tablets in, just to make sure that the tablet really is what it says on the outside of the box, all the way through to trying - as you mentioned in the intro, to sought out the world's energy crisis. What are we going to do when we can't use fossil fuels anymore? Kat - So how can we use lasers to make energy? Graeme - Well if you think about fossil fuels, what they are is they're essentially stored sunshine. Almost all of the energy that we use on the earth now started at a sunshine and the process, the natural process that drives sunshine is called fusion. The idea is to use high power lasers to get that fusion process under control here on the surface of the earth. Then you can take isotopes of hydrogen, you can glue them together in the fusion process, you can make helium, and you release energy. And that's the way the sun works and that's the way we would like to do it. Kat - And we've had a question in here from Paul Anderson who's in New Zealand who says, "if you're using solar rays in the dessert, it would take enormous cables, very expensive cables to transmit the electricity, but could we convert the energy into a laser beam? You could bounce it off a satellite back to Europe. You won't need cables at all." Could we transmit electricity by laser light? Graeme - It is an interesting thought. Yes, and in principle you can. People have looked at it for a number of applications. One is, can you use it to power that satellite? Satellite power is a tough challenge, and yes, in principle, it can be made to work, but there are issues, obviously. You'd have to decide how you're going to keep people you wanted out of the way, out of the way of the beam. It's kind of an unwritten rule that you never point a laser at anything you don't intend to do. And so, you would have to ask how you make sure it wouldn't go wrong. You've also got efficiency issues because even now, even with the very best lasers, they're not 100% efficient at converting electricity into light and then converting it back again. Kat - On the question of "you wouldn't want things in the way", we've had a question in from DavidWhalley94 on Twitter who says, "If you shone two lasers directly into each other, what would happen?" Kat - I love the idea of extreme physics. Just to return to the sort of applications of lasers, so we can do all these things, we can use them for seeing stuff, we can use them for cutting things. What actually determines the properties of an individual laser? How can you change them, tweak them? Graeme - Well, if for instance you wanted to change the colour of the laser beam, then you're going to have to change the stuff that's doing stimulated emission. And in the past, we've used everything from liquid dyes, to solid crystals, to gases. You can get a whole range of different colours that way. If you want to change the properties of the beam itself, if you want to focus it down or blow it up or propagated it a long distance then you would change the mirrors. You would alter the optics or you would put other mirrors in. Kat - So basically, it is just pretty much anything you can do with lasers. Is there anything lasers can't do that we'd like them to do? Gaeme - There are quite a few. We're still working not only on finding new applications for lasers, but there's still a lot of work on "the better laser". And as I say, it was dramatic results recently in the states, pushing the laser wavelength down into the very short part of the spectrum. Kat - What could you do with an x-ray laser? Gaeme - What can you do? Well you can do all the things that you can do with an x-ray light source, only a million or 10 million or 100 million times more quickly or faster. So for instance, they were using them for attempting x-ray imaging, they were trying to probe x-ray signatures of elements. There's a whole range of science that would've taken weeks that can now be done in seconds.